then sprinkle dry Ranch dressing all over. Less salt needs to be used. This recipe is very unhealthy for people with heart disease. I tweaked the recipe by leaving out the salty soup and ranch dressing. I add water while cooking and plain flour. I add salt in what I feel like is a healthy amount for me. I suppose the soup and ranch dressing could be used in smaller amounts along with plain water. The taste when making the original recipe is overwhelming with salt content. This was vary good. We added potato's and onions with low salt soup. easy to make with little prep time. this is going into my recipe box. thanks for sharing this. This was amazing!!! I bought nice, thick, boneless chops. They were shook moist and my family loved them!!! Definitely keeping this receive in my receipe box!!! Cannot wait to try this!!! Looks SO yummy!!! Do you brown the pork chops before you place in slow cooker? This looks very good, will try! My whole family loved this! They were quite skeptical since some of them do not like ranch dressing, but loved them. 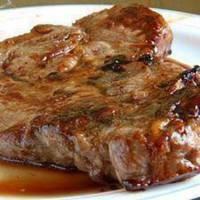 It's so easy to make and very moist pork chops. Made this. A bit salty but flavor was very good. Sounds easy and delish! Need to add this one to my menu.